Most people that play casino online are well aware of the game provider Netentertainment. This European provider has created hundreds of different slots and table games for online casinos. Players love games from Netentertainment and the company has won loads of awards for all amazing games. Every month Netentertainment is releasing a new slot with nice features such as bonus games and scatter symbols. And every time players get hysterical about the games and most casinos are running special campaigns and offers with focus on the new slot. It's now time for a new release from Netentertainment and this time it's the game Football: Champions Cup that will be released at most uk casinos. During the day you will se the new game Football: Champions Cup appear in most casinos online. When this happens you can be sure to get loads of emails from casinos that wants to offer you free spins or a bonus on the slot. One uk casino that is offering all players up to 200 free spins on the new netent slot is MrGreen. 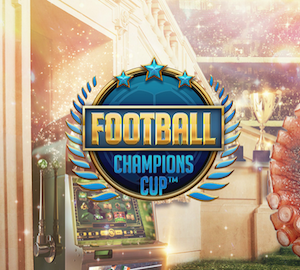 Between Monday and Thursday you can collect 50 free spins daily on Football: Champions Cup at MrGreen. And it's acutally really easy to get these free rounds since you only have to play the exclusive live game; Football Roulette. This game can be found in MrGreen's Live Casino and the roulette game will only be available this week. If you play 20 rounds on Football Roulette you will qualify for 50 free spins on Football: Champions Cup. And since you can use the offer daily you can get up to 200 spins depending on how many days you participate in the campaign. All the free rounds you collect during these days will be available for you in the new netent game on Friday. 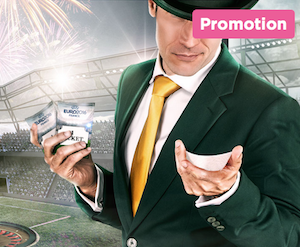 The on-going free spins promotion at MrGreen isn't the only football campaign running in the casino right now. At MrGreen players also have the chance to win tickets to the semi-finals in the European Football Champions right now. If you join this competition you will have the chance to win tickets to the semi-finals in France, flights to Paris, spending money and accommodations. If this sounds like a dream come true you definitely have to visit MrGreen now and collect tickets to the big raffle! To join the competition you just have to play on Extreme Live Roulette at MrGreen before the 31st of May. You have to play at least 20 games round in a row in this live casino game. Your mission is to reach the Golden Ball bonus round in this game. And if you have the highest stake over 19 game rounds the Golden Ball will be yours and you will get an entry into MrGreen's Euro Live Draw. This draw will take place in the casino on June the 1st by 9 am so make sure you are logged into the casino by then. If you haven't experienced this uk casino before now is a good time to do it. 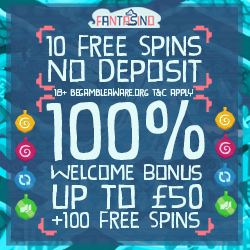 Just sign up through our site and you will get an exclusive welcome offer that includes 20 free spins with no deposit required. You will get your spins immediately and you can use them on the game Gonzo's Quest without having to risk any money of your own!